Puns, especially animal puns, bring a sprinkle of knee slapping hilarity to life. Really, what’s better than hearing about your favorite animal and a little snappy wordplay? If you like jokes about wild things, then you’ve come to the right place! Whether you’re looking for a doggone, funny animal joke, a purrfectly silly cat pun, or pun to quack up to, you’ll find them in our collection. You’ll be able to find animal puns you can use for greeting cards, text messages, or just to tell your family and friends to erupt in a whirl of unending laughter. See what they’re all about below and enjoy! Jump to any Animal Puns category on this page by using the links below, or simply scroll down to see them all. How did the Scottish dog react when it saw a ghost? What is a dog’s favorite type of homework to do? What do you call a magician? What did the dog say after a long day of hard work? What kind of dog does Dracula have? 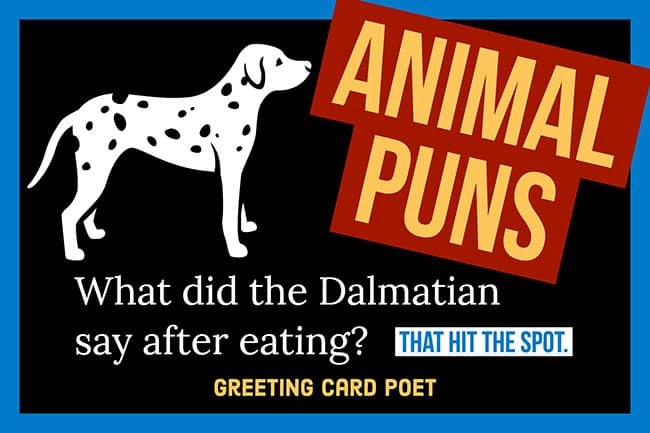 What did the Dalmatian say after eating? What did the dog hear after its performance? How did the puppy feel after losing his play ball? Who are always around famous pups? What is the only holiday dogs celebrate? 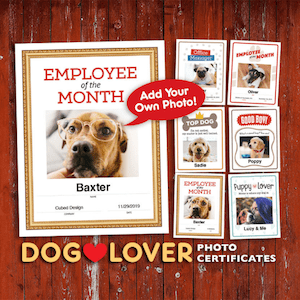 Click on visual above to learn more about these editable dog certificates. What did the cat order at Taco Bell? What do cats write their homework on? What do you call a feline who plays instruments? Why did the cat got to jail? Why are cats scared of trees? What do cats eat on hot days? You might like our very clean jokes page. What do you call cat police? What do cats wear to smell good? What couldn’t the kitten ever get anything done? Because he had bad pro-cat-stination. 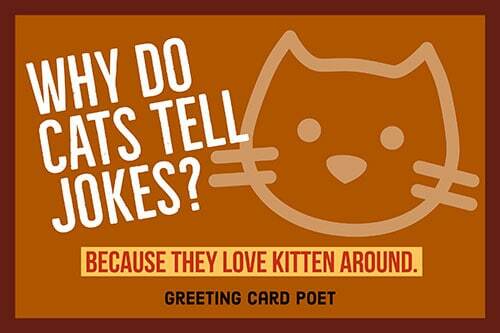 Why do cats tell jokes? Because they love kitten around. What do cats like to read? What do you call a painting of a cat? What kind of sports car do cats drive? What’s a cat’s favorite day of the week? Tip: These animal puns make for some fun captions for photos on social media posts. How do you catch a fish without a fishing rod? What is a bear’s favorite drink? Why don’t bears like fast food? Because they can’t catch it. What do you call a bear that flies and never lands? What do you call a freezing bear? How do you start a teddy bear race? What did the teddy bear say after finishing dinner? What do polar bears like to eat in the summer? What are bears called when caught out in the rain? What is a bear’s favorite pastry? What did the woman say to the arrogant equestrian? Get off of your high horse. Why did the horse save up so much money? Because it wants to be financially stable. What do you call a handsome horse? How much did the equestrian pay for his food? Where do pony hear rumors? Why are horses so kind? Because of their amazing horse-potality. What is the only food that will race a horse? 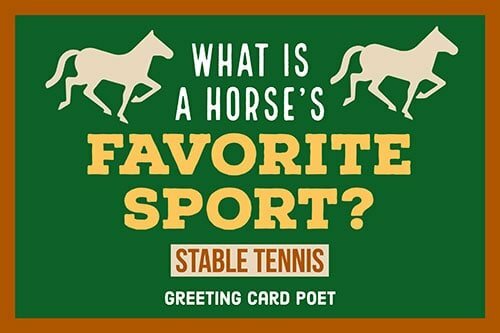 What is a horse’s favorite sport? Why was the little pony removed from class? Because he was horsing around. What do you call a horse who has seen the world? Who plays music at parties for horses? What kind of bread do horses eat? What did the equestrian say to his sad horse? Where do you take sick ponies? When do vampires like horse racing? When it’s neck to neck. What kind of bad dreams do horses have? What do you call a horse that lives next to you? Why did the parrot stop performing at the circus? Because he said it was too much of a birden. What should you never do to an angry bird? How were the birds able to throw a successful event? Because everyone was piggeon in. What do you call a bird in prison? Why did the bird get in trouble in school? Because he was caught peeping on the test. How do chickens get strong? What do crows use to stick together in a flock? What did one egg say to the other egg? What do you birds eat for breakfast? How did the egg cross the road? What do you call a sad bird? What kind of math do Snowy Owls like? 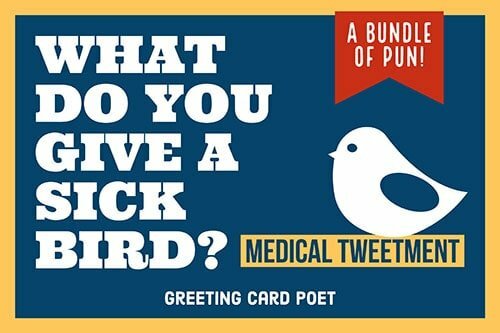 What do you call a very rude bird? What do you call a sick eagle? What’s a parrot’s favorite game? How many birds does it take to change a lightbulb? What did the bird say when it was cold? Where do birds invest their money? 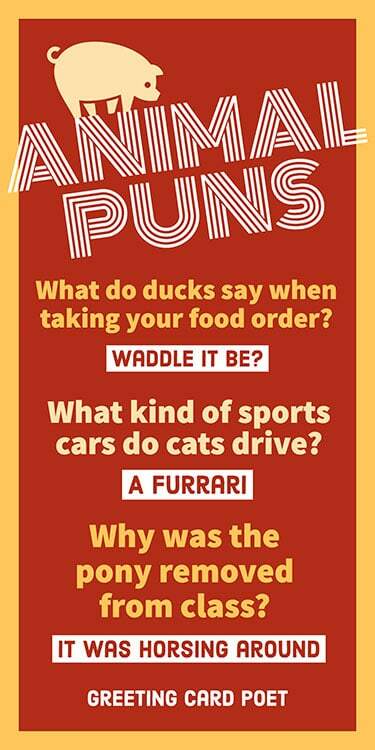 What do ducks say when taking your food order? What do astronomer ducks study? At the quack of dawn. What do ducks get after they eat? What do ducks do on the Fourth of July? Why do ducks watch the news? Where to sick ducks go? What did the detective duck say to this partner? I hope we quack the case. How do ducks carry their books to school? What do you call a duck that can fix anything? What do ducks do after hearing a joke? Who is the new heifer? What did the buffalo say to his son who was departing for college? What do you call an owl who does magic tricks? What job did the frog have at the hotel? What do you call a lazy kangaroo? Puns can be found in everyday life, both intentionally or accidentally and create humorous effects, depending upon the ambiguities that a word(s) entails. By definition, a pun is a humorous play on words formed in a phrase to emphasize or suggest different meanings, especially by similar sounding words. You’re on our Puns page.